AFRICANGLOBE – Dangote Group on Tuesday inaugurated its 1.5 million metric tonnes per annum (mmtpa) capacity cement plant valued at $400 million with a 30 megawatts coal plant to power the factory. The project was inaugurated by Zambia President , Edgar Chagwa Lungu, at Masasiti district, Ndola, Zambia. The event was graced by Vice-President Yemi Osinbajo, Edo State Governor, Adams Oshiomhole and his wife; Tony Elumelu, Chairman UBA Plc; and Chief Kola Jamodu, Chairman Nestle Nigeria Plc; Niyi Adebayo, former Governor Ekiti State, among other VIPs from Nigeria and Zambia. Speaking at the events, Osinbajo, said the projects was very significant to bilateral relationship that has existed between Nigeria and Zambia. He lauded the government of Zambia and the people for having approved the projects and nurtured it to completion. President Lungu also said Zambia has continued enjoying very cordial bilateral relationships with Nigeria over the years, assuring them that his government will continue to encourage private sector initiatives. “I invite other investors to genuinely come and invest in other sectors in Zambia,” he said. President of Dangote Group, Aliko Dangote, in his speech, said the Zambian cement plant was the sixth out of his 14 cement plants in Africa to have started productions, adding that four new plants would be inaugurated before the end of this year. “We are spearheading the economic revolution in several African countries; we are a strong advocate of Africans investing in Africa,“ he said. The Special Adviser to President/CEO, Dangote Group, Mr. Joseph Makoju, stated that with the investment, Nigeria can now proudly claim to be the economic leader in Africa “because this day, it is more about economic diplomacy rather than political diplomacy. 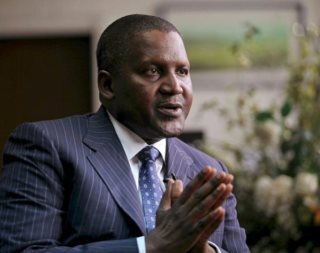 “So what Dangote is doing here is strengthening Nigeria’s position indisputably as a leader of Africa, economically and politically.“ he said. Elumelu lauded Dangote for the feat and described him as the only private sector investor driving cross-border investments in Africa. “This is economic diplomacy and Dangote is helping to foster bilateral relationship between the countries in Africa, “ he said. Oshiomhole on his part, also hailed Dangote for playing a pioneering role of Africans investing in Africa, and creating jobs across the continent “Politicians make noise about jobs creation, Dangote does not make noise, he goes about creating jobs. “He is providing economic bridges to promote peace and unity through his investments in Africa,” he added.